This winter has been a strange one in Denver – it’s felt more like spring with mild temps and little snow. So our decision to not get a ski pass this year has felt like the right one with the sporadic snowfalls. 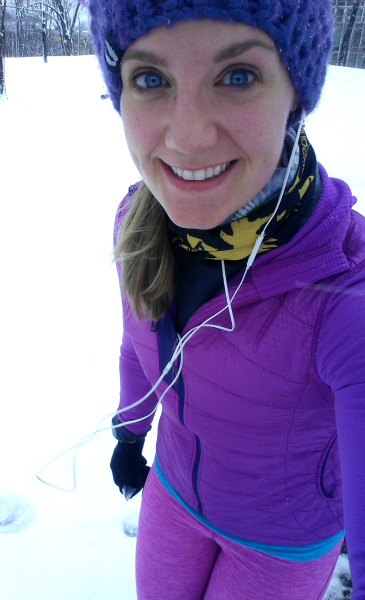 Knowing we wouldn’t be spending much/any time skiing this season, I opted to test out the Outdoor Research Plaza Vest + Outdoor Research Pentane Tights to take along on snowshoe/hikes, bike rides, runs and urban adventures. I’ve really appreciated this vest through this mild winter. I don’t need much more than a long sleeve shirt, liner gloves and this vest to keep warm. The front and back are insulated with 700 fill down and side panels are a stretchy, breathable fabric so it keeps me snug and happy but not overheating when moving. Both hip pockets include zippers which I love so I don’t loose snack wrappers on a hike or keys while running in the city. There’s an interior zip pocket on the chest and 2 non-zipper, deep interior pockets for even more storage. 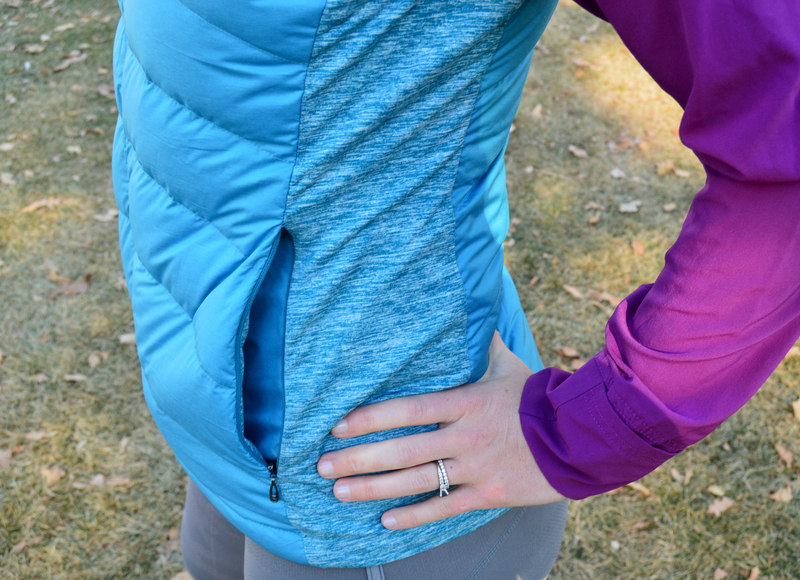 From a snowy trail to a chilly Seattle bike ride, this vest gets 2 thumbs up. What drew me to these tights was the reflective pattern printed on the fabric (which is hard to photograph in light or dark!) since it most of my weekday runs are dark after work. These tights are stretchy and breathable, super comfortable and warm to exercise or hike in. The waistband is a softer fabric, rather than stretchy, so can sometimes get a little loose but the drawstring helps keep things in place. They’re a bit short on me (not sure if it’s because I’m a giant or it’s the intended fit) so these hit me at/slightly above my ankle so I tend to pull these out on non-wet/snowy runs. Overall, solid pair of hi-vis running tights. DISCLAIMER: As a participant in Outdoor Research’s #ORInsightLab, I am offered the opportunity to test seasonal gear in exchange for my honest review. This post is not sponsored but I did receive the gear for free. This summer, I tested out 2 jackets from Outdoor Research as part of their #ORInsightLab team and I’ll be profiling them this week and next. 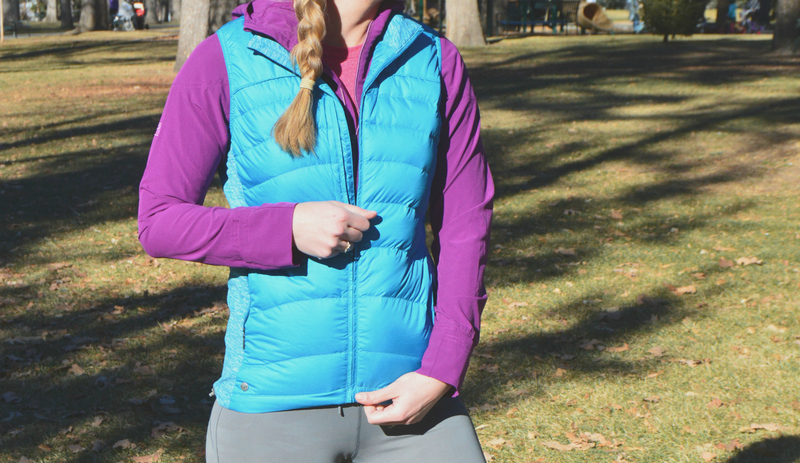 First up, the Helium II Women’s Jacket! 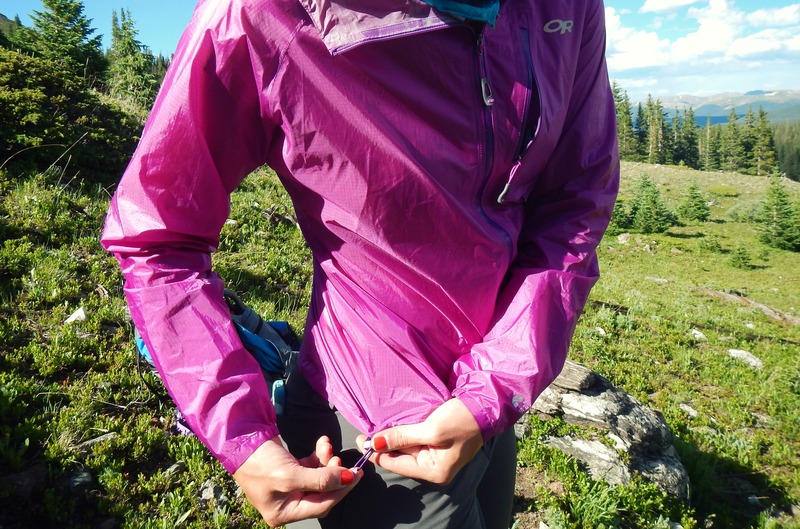 This jacket has been heavily praised, winning awards like ‘Best Waterproof Running Jacket Winter’ from Runner’s World or ‘Top Pick Award Winner 2015’ from Outdoor Gear Lab so I was pretty pumped to pack this jacket for my summer adventures. Unfortunately, my summer adventures were mostly hot and dry so I didn’t get much of a chance to put the waterproofness to the test too often but will be doing so this fall during rainy season in Pittsburgh. But I will speak to the breathability and packability because both are excellent attributes of this jacket because both are outstanding. I’ve brought my Helium II jacket with me on every single hike and trip in the past several months and have worn it frequently when it’s windy and as a layer when the sun starts to sink lower in the sky and the air cools down in the mountains. 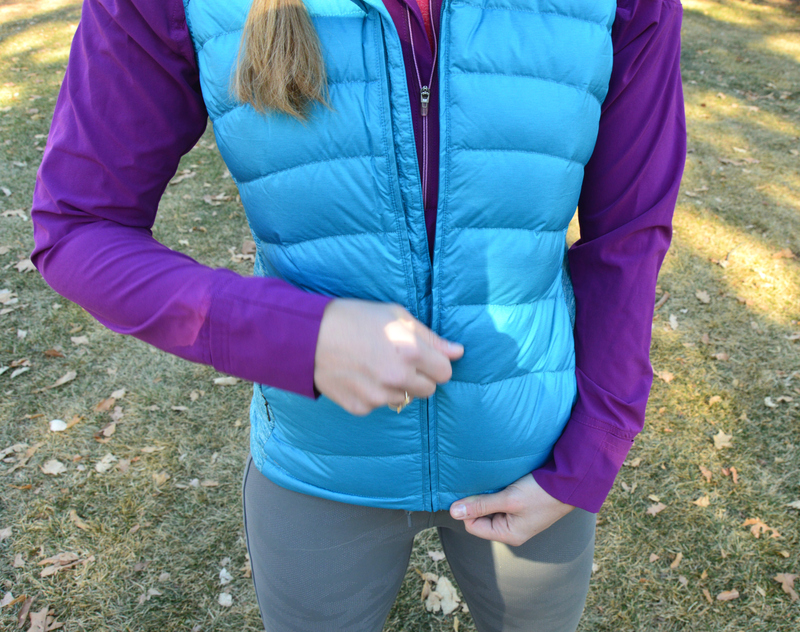 On cool morning hikes in Idaho, this jacket was the perfect layer over my shirt to keep me warm from the light breeze but, because of the breathability, I never felt uncomfortable, even when hiking up steep grades. And as it relates to packability, can’t be beat with this one. It’s extremely lightweight, clocking in at 5.5 oz (less than half the weight of my Clairvoyant jacket) and packs down such that I can hold the entire jacket in my fist. It’s extremely easy to stuff into a 65L backpack for an overnight trip or a small trail running pack without giving up much/almost any retail space. The tradeoff with lightweight is that there aren’t any exterior hip pockets. (There is an exterior chest pocket, though.) This did take adjusting on my part because I so frequently jam my hands, phone or snacks in the exterior pockets of my jacket that it felt strange to not have them. But after a few wears, my brain figured it out and I found alternatives. Two additional features I really like about the Helium II jacket are the internal pocket and the drawcord hem to cinch the waist. As I adjusted to the loss of external pockets, I quickly found the internal pocket to be useful in carrying snacks or my ID/credit card. Again, not my first instinct so reach inside my jacket for key items but it was nice to have a place to put small items that I wanted on my person. This pocket also doubles as a stuff sack with a carabiner loop – great for clipping to a climbing harness! Most of my adventures kept my feet on the ground but the Helium II would be a great addition to any climbing trip. 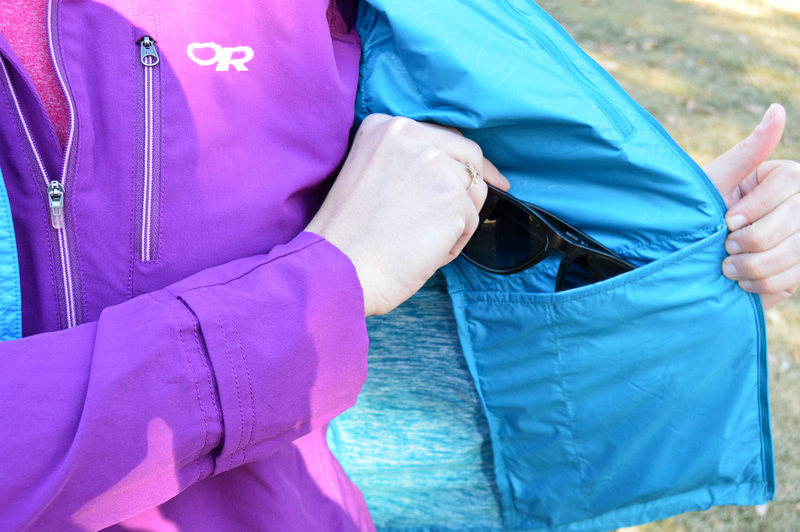 The drawcord hem is a feature I’ve really come to appreciate in my active jackets. 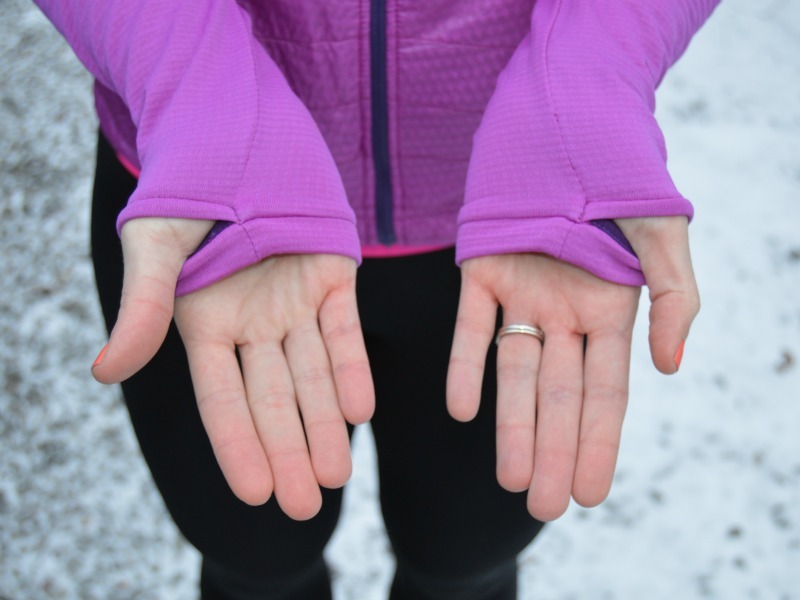 When the temperatures dip or the rain is pouring, I like being able to cinch down my outerlayers to preserve warmth and keep moisture out. 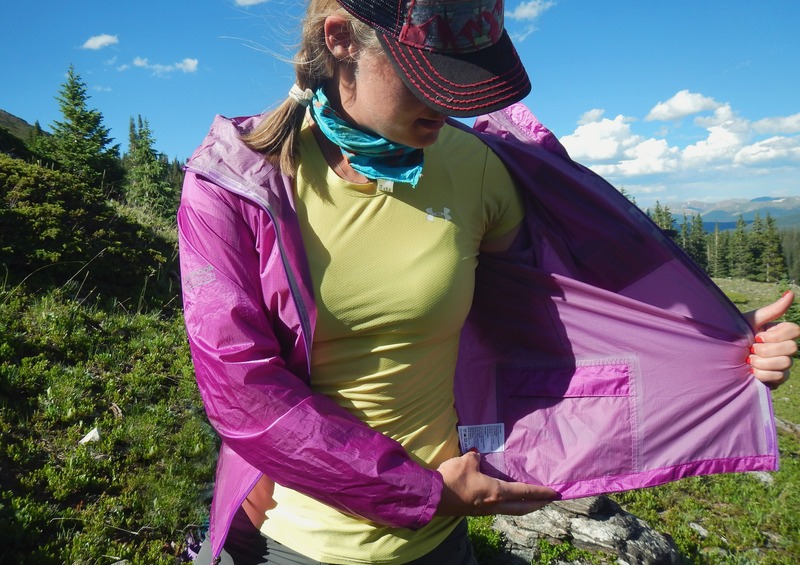 Overall, really loved the lightweight and breathable Outdoor Research Helium II Women’s jacket. There’s no question that it will be a tagalong on outdoor adventures of all varieties for many, many years to come. Sizing: I am 5’11” and am wearing a medium; jacket runs true to size. 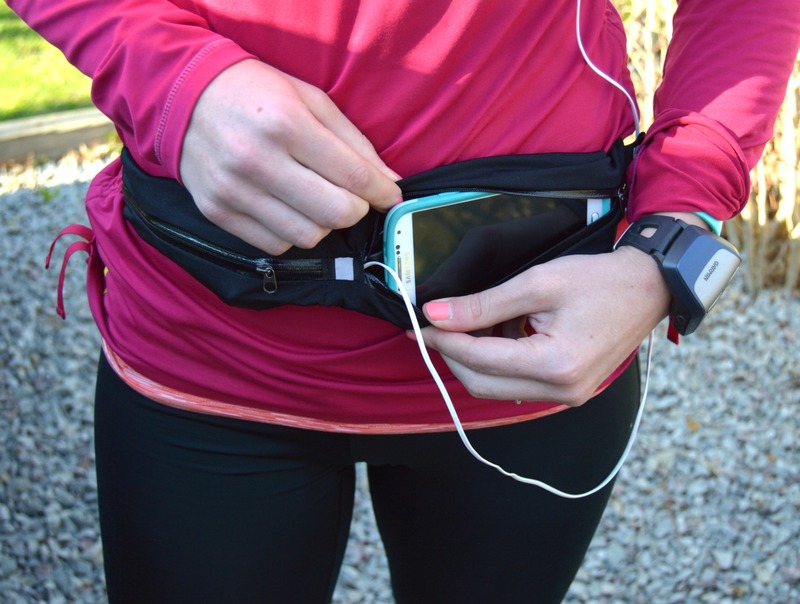 Last fall, my friend Chelsea connected me with her contact at SLS3 to review their Dual Pocket Running Belt. Travis, at SLS3, assured me that this is his favorite running belt of the bunch and actually stays put while running. Admittedly skeptical, I agreed to try the run belt and see if it lived up to Travis’ hype. In my early days of running, I tried a whole slew of running belts: ones that zipped, ones that flipped, ones that held water bottles. None I loved – they jostled too much, crept too far up my waist or didn’t hold everything I wanted to carry with me. I gave up on running belts and switched over to a small CamelBak pack and have used a small pack ever since. 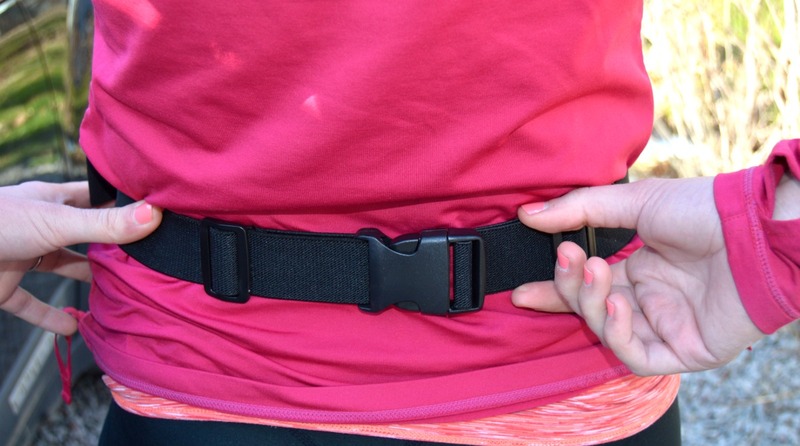 But this is exactly why I agreed to try the SLS3 belt – I went into this experience with an open mind, ready to see if the world of run belts had changed over the years. I knew I wouldn’t want to run the Pittsburgh Half with a pack so I was hopeful this run belt would perform well enough to win a spot in my race day outfit. And ya know what? It did! The dual pockets on this belt are huge but still lay flat on my person while running. I slip my phone (Samsung Galaxy s4 + Otterbox case) into one pocket and my keys, snacks and chapstick in the other. I probably wouldn’t try to add too much more in the pockets but there is some extra room to carry cash, ID cards, pepper spray, etc. Amazingly, the belt really does not really move, even when packed with all my things. I suspect I can thank the the wide strap and buckle – the strap is 1.5 inches wide which is the same size as the pockets, not expanded, and when clipped together, the belt feels sturdy. Past belts I’ve used have had a thinner strap so when the pocket was full, there was no support to keep it in place. Not the case here! I’ve used this belt on a number of shorter runs and my 10 mile run at the park and I’ll be wearing this belt for the Pittsburgh Half Marathon this weekend. I love that I can stuff my phone and keys away – but still have easy access to pull my phone out for photos #realtalk. 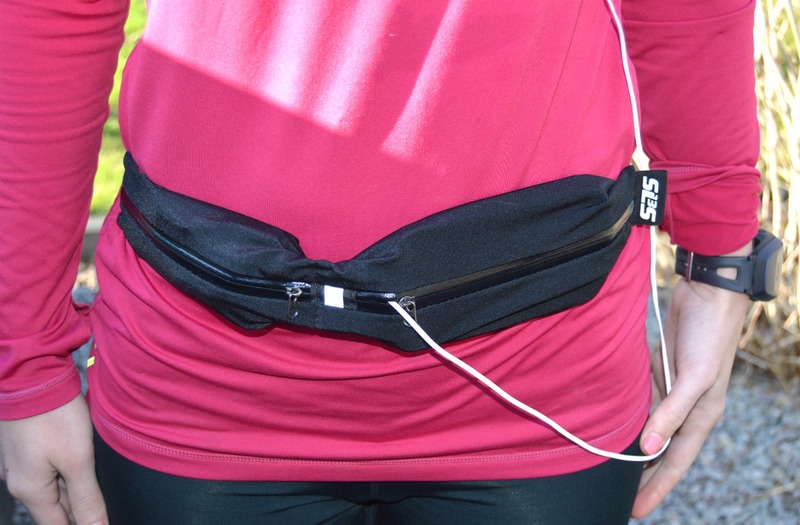 Want to try a SLS3 Dual Pocket Running Belt for yourself? The team at SLS3 has offered to give one away! Enter through the Rafflecopter link below; giveaway closes on 5/2 at 12a EST. Winter did not come to Western PA this year. And this winter-loving gal was so disappointed! Thanks to Winter Storm Jonas in January, we got one solid dump of snow and past that, there wasn’t much snow to write home about and certainly not enough to play in. It was so stinkin’ mild! That said, I did find a few opportunities to get some snow time in to test the Outdoor Research Women’s Trailbreaker Pant. I took these pants to Colorado in December and Oregon in March to ski and the day after Winter Storm Jonas, I hit up the local ski hill here in Pittsburgh for a few hours of midwest runs. I’d hoped to get more snow adventures in before the official start of spring but the weather has not been on my side. As you can see in the very top photo, these pants have a clear upper/lower separation and each portion was thoughtfully designed to accommodate snow adventures. The upper is made of a breathable, double woven soft-shell fabric so it’s super stretchy. 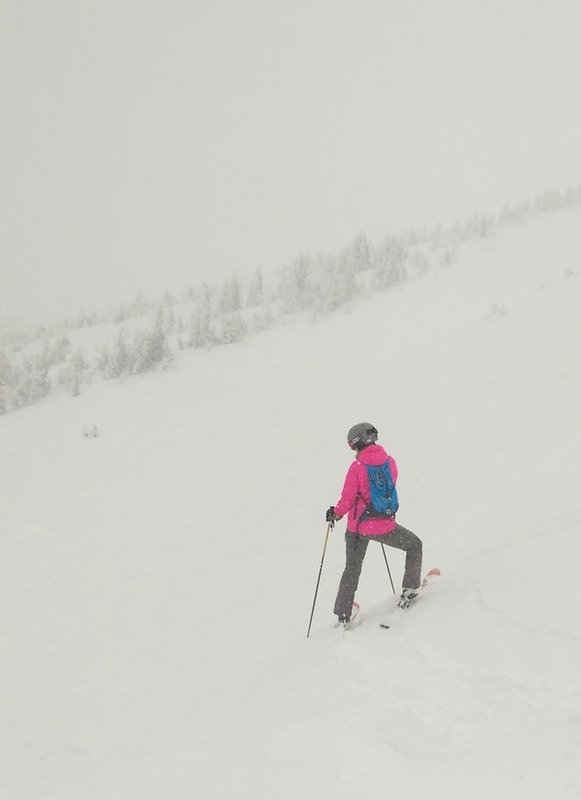 The legs of the pants are made of waterproof three-layer Pertex® Shield+ so when you’re skiing, skinning or snowshoeing, your pants and legs stay dry. These pants run true to size and are fitted but still roomy enough to wear running tights underneath for the chilly days. Removable, zippered internal gaiter with power strap slot – Honestly, I used this incorrectly and did not put my power strap through the slot but I *did* use the zipper to access my boot buckles when I wiped out and my buckle unclipped. That said, the gaiter is removable, if you so choose, but they also make your boots easy to reach without having to readjust your gaiters. 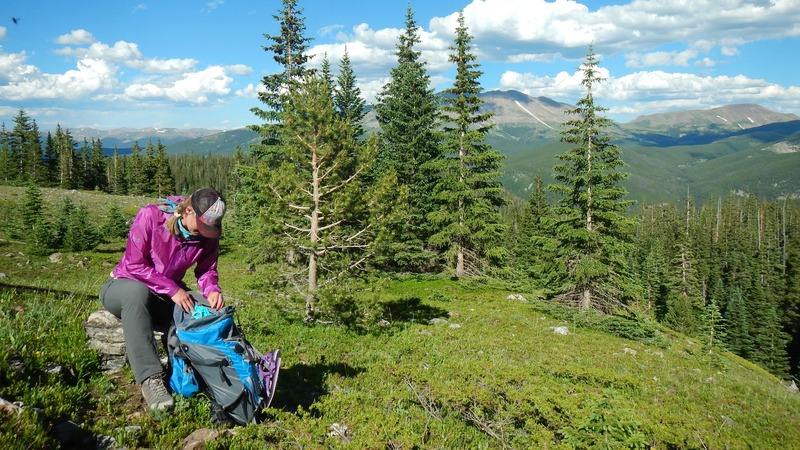 Avalanche beacon pocket – For backcountry enthusiasts, avy beacons are a must. The Trailbreaker pant includes a zippered pocket with a mesh section and key clip to hold a beacon for safer backcountry play. The last thing anyone wants to happen is to lose an avy beacon if you’re caught in a slide so wearing one in a zippered pocket, clipped to the pants, is a pretty smart design element. 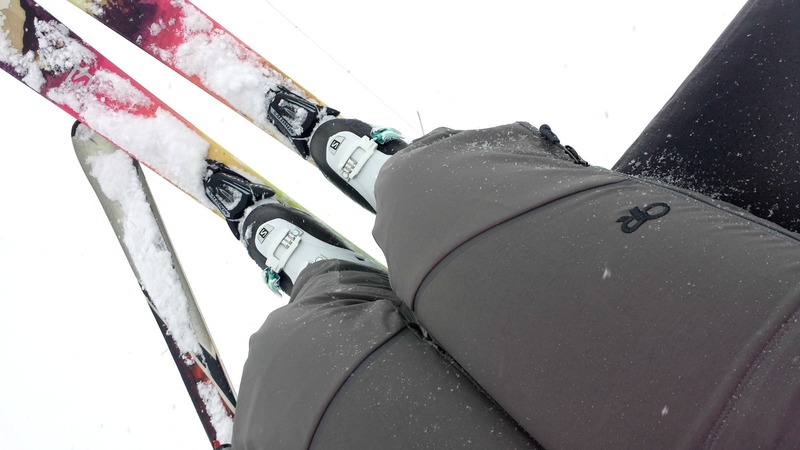 Zippered outter thigh vents – while I didn’t have much need for these this year resort skiing, I appreciate this element in thinking about previous backcountry trips. Having an easy way to cool down when snowshoeing many miles uphill into a hut would be phenomenal! This hoody, you guys. This hoody! 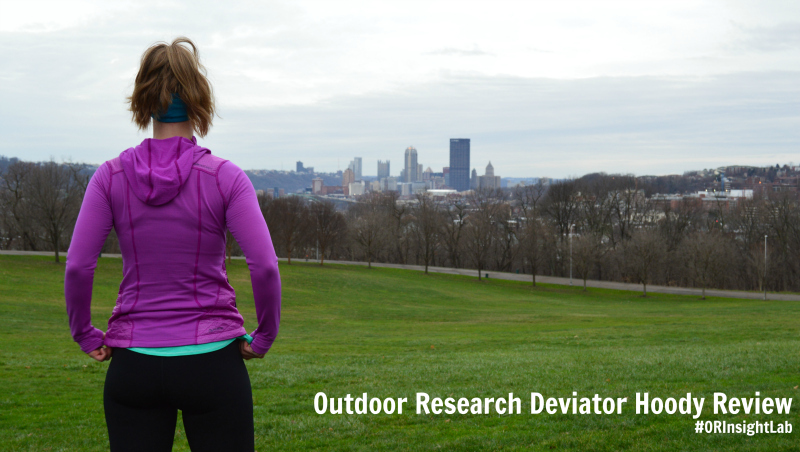 I have worn this Outdoor Research Women’s Deviator Hoody for nearly every run since I received it earlier this fall. I’ve worn it under my coat skiing. I’ve worn it running to/from OrangeTheory classes. I’ve worn it around my apartment when it’s chilly, thanks to old and poorly insulated windows. If I didn’t have to take it off to clean it or myself, I wouldn’t. In love. Knowing I’d be training throughout the winter for my half marathon, when Outdoor Research reached out about testing fall/winter gear, I opted for the Deviator Hoody as the internet, Backpacker and Runner’s World have given it rave reviews. It’s this weird and amazing hybrid jacket that’s part insulation in the torso, part base layer in the arms. But it’s completely genius and incredibly comfortable. 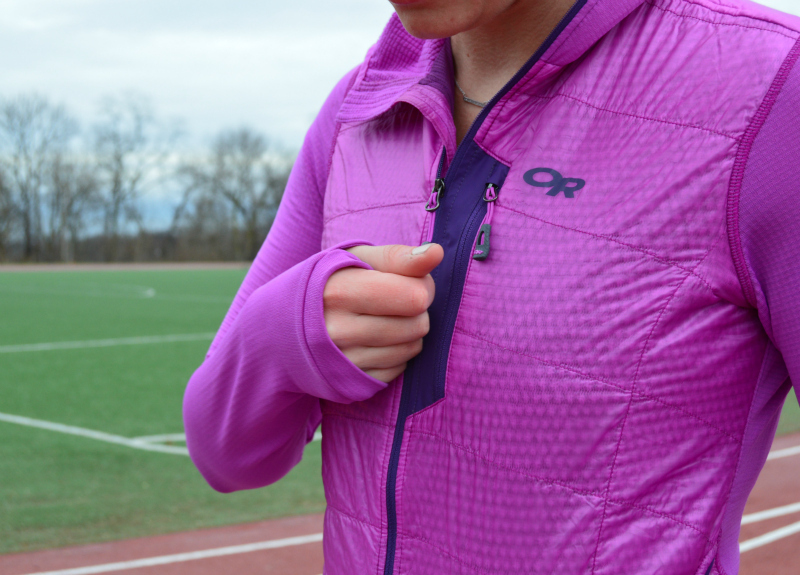 So, the details: this jacket features Polartec Alpha insulation in the front keeps the core warm – especially when running into Pittsburgh headwind. The Polartec Power Grid material in the arms and back wick moisture to keep me dry and warm. It’s super lightweight but seriously warm; I wear just a synthetic t-shirt or tank underneath and head out the door to run. Sometimes, if it’s extra windy (hi, Pittsburgh), I’ll throw a really thin windbreaker on top but in general, the tshirt/jacket combo has worked really well. A few highlights outside of technical performance for me are the wrist cuffs and deep pockets. Of course, thumb holes are always awesome on a cuff but what I really love about these cuffs are how they are reinforced. You can see the dark purple lining in the photo above; the reinforcing gives the cuff a sturdy structure so the sleeve stays put. I hadn’t noticed that other jacket sleeves jostle around until this one decidedly did *not*. Using the thumb holes or not, the cuff stays put and I’m down with that. Okay, onto the pockets. 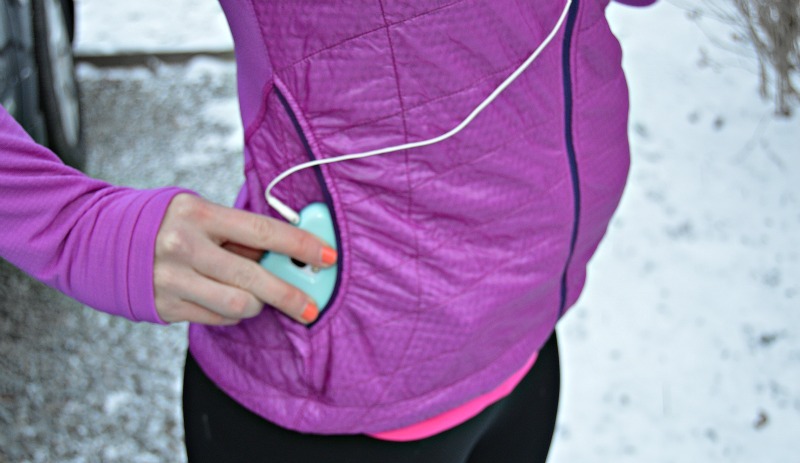 The pockets on this jacket are very deep and wide; it was a pleasant surprise that not only does my phone (Samsung Galaxy 4) fit in the pocket but it can lay down horizontally and NOT BOUNCE AROUND DURING A RUN. Seriously. This jacket stays flush against my body with a cell phone in my pocket. WUT!? I don’t know how the magicians at OR made this work but I really appreciate that they did. So through the rest of half marathon training, you can find me running around Pittsburgh in this jacket. Once the weather warms back up, this jacket will be perfect for snuggling up to sleep in a sleeping bag on cool spring evening or trekking into a crag for early morning summer climbing. 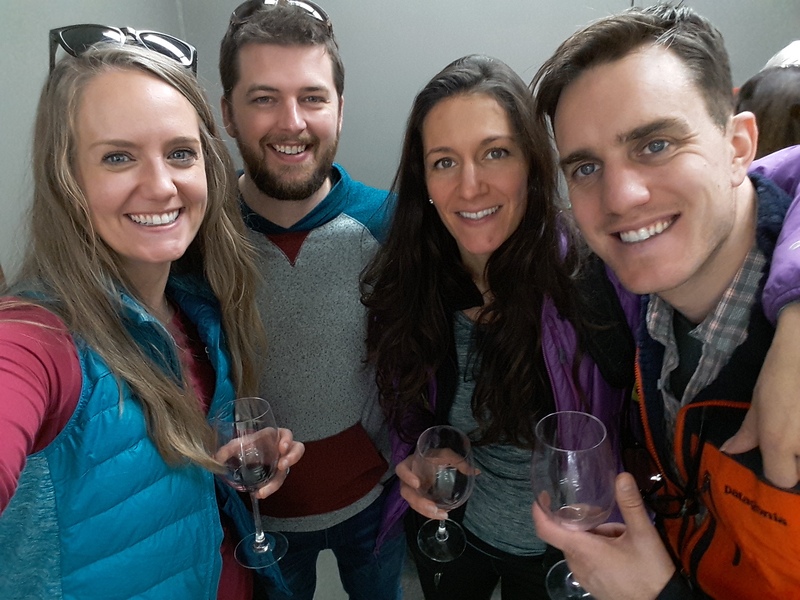 Earlier this year, I hit up the 4th Annual Blend Retreat when it was hosted in Boulder again (yay!) and one of my favorite pieces of swag was the Soybu Killer Caboose Leggings included. They were stretchy in all the right places and didn’t droop into the dreaded ‘diaper booty’ like so many leggings do. These leggings even stood up during a 4 mile hike in Utah! Because I loved the legging so much – and really love supporting local companies – I reached out to Soybu to ask about hosting a giveaway so help get their product into your hands, too! Founded in Colorado, Soybu is an active fashion apparel line built on the principle that the only sure thing in life is its unpredictability and the clothing reflects this, able to transition from studio to street and everything in between. 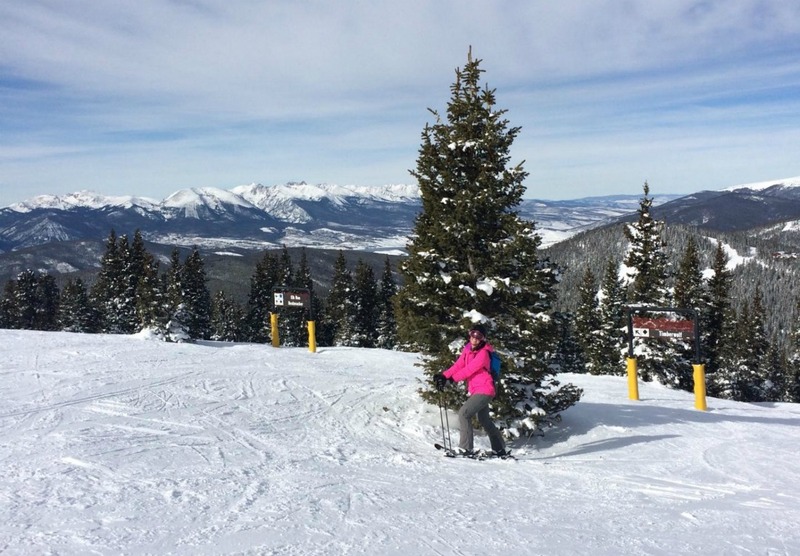 Given that this is the general attitude of Colorado where our outdoor clothing also doubles as everyday wear, Sobyu is a perfect fit for both Coloradans and active women everywhere who want to feel good and look good in their activewear. As a gal who works in a casual office and frequently wears athletic clothes to work, I love that this outfit fits just as well at 8 a.m. as it does at 7 p.m., after a long day at work and a lunch time bouldering session or late afternoon run. And for my long-waisted, short-legged sistas, the Mira Tank is a great choice. Before selecting a full outfit to review, I asked the Soybu team which of the tanks was the longest as it’s really tough for me to find a tank that fits properly and they recommended Mira, Cierra and Ariel. Wearing the Mira, I don’t feel the need to adjust it or pull it down every few seconds like I do with other, shorter tanks. As you can see in an above photo, it hits well below my hips. I also really love that Soybu is affordable and great quality! While there’s a time and a place to pay $$$ for active wear, I really appreciate a company that makes great clothing, that fits and looks great and doesn’t break my bank. Giveaway closes on Sunday, July 12 at midnight MST. All entrants will be added to the Soybu email newsletter and will be sent a 25% off coupon so if you don’t win, you can at least enjoy a discount! And if you’re in the Denver area, stop by the Soybu flagship store in Greenwood Village! (Intersection of Orchard and University). DISCLOSURE: The outfit photographed was provided to me at no cost but I was not otherwise compensated for this post; I really loved the clothing and the fact they are Colorado grown and wanted to share the love! Disclosure: I’m participating in Outdoor Research’s (OR) #ORInsightLab to help test gear and offer feedback. This shell jacket was provided to me at no cost but, as always, opinions are my own. You can find my other Insight Lab reviews here: Airbrake Climbing Gloves, Voodoo Pants. Oh, where to begin with this jacket…I could wax poetic for hours about this beauty! Hands down, this jacket has gotten the most use of the OR gear I received to review. It’s incredibly versatile and looks great when I’m out to dinner or running errands yet also functions amazingly well out in the backcountry or on the trails. Most surprising was how buttery soft it feels; a super soft shell jacket that solidly performs in adverse weather? I’m in! It’s also, coincidentally, in my favorite color which is super cool. OR says on the website that they designed this for women, by women, and it’s obvious. It fits exactly like I want a jacket to fit – slimmer through the torso, sleeves with cuff closures that fit over my watch and it’s long enough to hit my hips and not irritate my back under a hip belt. So much rain! So much waterproofness in the jacket! I took this jacket on our wet and rainy Mt. Antero camp/climb last weekend and really appreciated the halo hood feature. It kept the rain out of my eyes while I munched on my dinner. Another design feature I really appreciate is that the pockets are situated higher on the jacket so they don’t interfere with a backpack hip belt as other jackets do. I can still unzip, put trash or my phone in and re-zip without messing with my pack at all. And when you’re trying to outrun a booming thunderstorm, the last thing you wanna do is worry about adjusting your pack. Another perk? I’m super tall (5’11”) and have a long torso yet this jacket is long enough to hit my hips without me yanking on it constantly. Pit zips would be a ‘nice to have’ but not a necessity for me. Overall thoughts? This is a solid, high-quality, superior performance (and not to mention beautiful!) shell jacket that is a staple item for adventures of all seasons and all types.